While everyone else is headed down, Anderson Silva is on his way up. Ultimate Fighting Championship veterans Mike Nickels and Luke Caudillo, along with Ultimate Fighter alumnus Noah Thomas return to action on Friday night in Denver as the trio head up Ring of Fire 32 “Respect.” The event takes place at the Broomfield Event Center – where the UFC recently held one of its most successful UFC Fight Night’s ever – which has been home to the Colorado-based Ring of Fire for its past five events. Nickels returns in the main event, having lost his last time out to Stephan Bonnar at UFC 73 in July of 2007. He faces tough European striker Vladimir Vuckovic, who is also an accomplished boxer in addition to his successes in mixed martial arts. One feature bout pits Ultimate Fighters 5 fighter Noah Thomas in a grudge match with another local favorite in Brett Roller. These two have a history that goes back to when they were on the same wrestling team in high school, but weren’t exactly the best of teammates. Following a big victory over UFC veteran Junior Assuncao at the recent American Fight League event in Atlanta, Torrance Taylor returns to action a mere two weeks later looking to add another UFC veteran to his resume. His opponent, Luke Caudillo, wants to get back on track after dropping two straight in his unsuccessful UFC campaign. In a 135-pound women’s feature bout, local standout Cat Albert looks to continue her streak towards the national promotions that are rapidly beginning to add women’s divisions as she faces Xtreme Couture fighter Karina Taylor. Already listing a who’s who of fighters for their debut card on July 19, Affliction appears to have two more aces up their sleeve. According to MMARated.com, a press conference slated for Thursday will unveil former UFC heavyweight champion Andrei Arlovski as the latest addition to the upstart promotion, bringing to fruition his long-rumored bout with Ben Rothwell. The press conference, scheduled to take place in New York City, will also see the introduction of real estate tycoon Donald Trump as a new equity partner with the promotion. According to Michael D. Cohen, Executive Vice President of The Trump organization and the Special Counsel to Donald J. Trump, the billionaire will be on hand to announce the signing of Arlovski. Arlovski’s bout with Rothwell will take place at “Affliction: Banned,” set for July 19 and taking place at the Honda Center, in Anaheim, Calif. The card is headlined by top heavyweight Fedor Emelianenko and former UFC heavyweight champion Tim Sylvia. While nothing has been confirmed in regards to this appearance, there are rumors circulating that former UFC light heavyweight champion Tito Ortiz may appear at the press conference. While no details about a possible contract have surfaced, and granted the UFC still has a right of first refusal on his contract, a source told FiveOuncesofPain.com that Affliction is considered a leading candidate for Ortiz. Matt Hughes has confirmed that he will be fighting Matt "the terra" Serra, win, lose or draw, after his fight with Thiago Alves. The UFC has apparently given the fight it's blessing according to MMA madness and the fight will take place either UFC 89 or 90 - sometime in October or November. If Hughes is able to win both fights, he will be given another welterweight title shot against G.S.P. 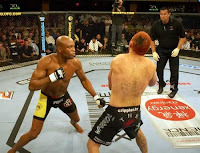 This fight has been brewing since Serra and Hughes were team captains on the successful TV show "The Ultimate Fighter." Matt Serra who recently lost to G.S.P will want to get back to willing ways and will no doubtable voice publically his hatred for Matt Hughes. The fight promises to have plenty of smack talk and hype leading up to it. Hughes also stated during the week that his brother has signed a contact with the UFC agreeing that he will not fight for any other organisations. Matt Hughes refused to comment any further on the situation.